Friday 30 November: Departure day! Strong winds and rough seas. During the night the wind continues to howl in the rigging and Glen wakes several times thinking: seriously? Are we really heading out in this? He also has a dream of rouge waves at the point where the 2 wave fronts collide in the lee of Bermuda. Needless to say, sleep was light for the captain. We wanted to be off at first light so 6am the alarm goes off. Unfortunately the internet has crashed so the video we had started to upload stalled in the night. So it’s a restart then back to bed for another hour to let it finish. At 7am, a quick look at weather forecast again, secure everything that may slide or roll (as we will be rolling badly), rig the pole, prepare the sheets, and the usual pre-departure checks. Plus few last emails before we cut off from internet and the civilized world. We were contemplating on topping up with fuel. We’ve used approx 150 liters coming from USA to Bermuda, so we have 800 litres left in the tanks. That should last us OK for 4 full days of motoring. Which, with the current weather forecast, will not be needed. The diesel price here shocked us @ $1.93/liter, especially after USA where it was $3/gallon! Even in Martinique, where we bought the most expensive diesel, it was Eur1.25/liter. So we decide not to top up. Couple of hours later we are ready to slip the lines. This is easily done given the wind is blowing us off the quay. As we reverse out the harbour we see our friends on the Swan-66, Gale, tying up at customs. They are also leaving today. We do few circles in the harbor, to get ourselves ready. Fenders up, warps stowed, mainsail 1/2 out, pole deployed. 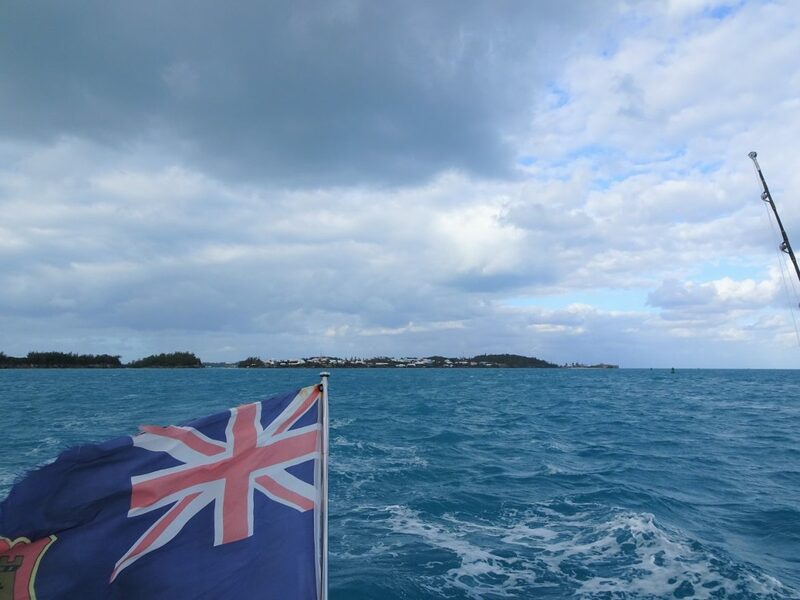 Then we wave farewell to St. George’s and Bermuda, and we’re off! Going through the Town Cut was a lot less dramatic than at our arrival. Now that we can see it, it doesn’t feel threatening at all. Bermuda’s shoreline is very pretty seen from the sea. When we came in we didn’t see any of it as it was dark already. But now we are enjoying the sights and we can identify the forts or the beaches where we have been on our GoCycle and scooter trips. The wind is 20 gusting 27kts. Glen wants to be more sporty while in this flat water so the mainsail is fully unfurled. With a full set of sails up, sporty he wanted, sporty he got – wow what a ride! We scan the competition on AIS. Looks like several yachts also have our plan to leave today. We guess our idea to leave in this wind and waves was not so silly. Ahead of us we have: Sky Lark, a 72ft catamaran doing 13kts. Hm…he’s gonna win the race, let’s forget about him 🙂 Compass Rose, 43ft, doing 8kts. Mah Jong, 52ft, doing 8.9kts. Same as us. And behind us: Gale, 66ft, still faffing with their sails outside the harbor. Gheko, 39ft, doing 7.7kts. We are doing 8.5-9.5kts, depending on which side of the wave Cloudy Bay is. We get a VHF call from Mathew on Gheko asking if we see them on AIS. And during the call we find out they are also heading for Jolly Harbour, Antigua. What do you know, looks like we will have a race all the way down there! Let’s hope they will put up a good fight! Sea is getting bigger as we are moving further away from Bermuda. Waves are 3-4m and quite short pitched, throwing us around, and we are rolling accordingly. When gusts hit us, we surf nicely at 11kts, and that is quite thrilling. And we clocked 23nm on our first 2.5hrs of log. 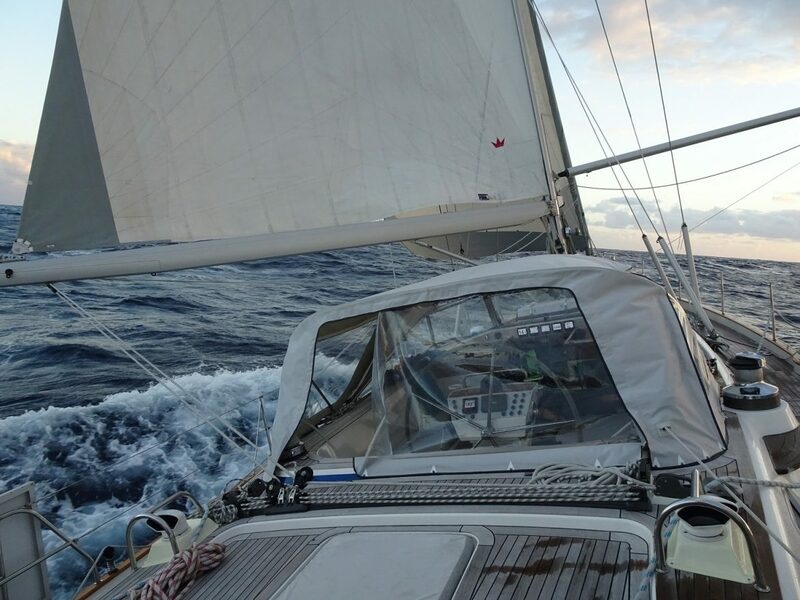 At first we set our course slightly more east than one would normally go for Antigua, plan being to hit the trade winds on a better angle in the coming days. But then Glen finds that sailing on the rhum line is much faster and more stable. And certainly a more thrilling ride. Not so thrilling for me though. The motion is not one that suits me and I start to feel queasy. Well, we only have 12 more hours of this then we will likely be motoring for a day across the high pressure zone till we hit the easterly trades. On AIS we finally see Gale coming away from the island. Then, all of a sudden her AIS icon has a dotted outline (never seen that before) and is pointing back to Bermuda. We call them on VHF. They are not actually returning to Bermuda. They have a problem with their electronics. The AIS is not transmitting any navigation information, like COG, Heading, SOG. But it is transmitting identification and position OK. So for the rest of the day, Gale’s AIS icon on our screen looks like they are reversing at 10-12 kts all the way to the BVIs! Soon we are very much out of Bermuda’s shelter. The waves are massive, averaging 4 m but the odd one at 5m plus. So every now and then we severely roll when a particularly steep one takes us side on. One of these throws me off the cockpit seat! Then later on Glen is one second getting something from a drawer on the starboard side and next thing has slid across the saloon carpet into the galley on the port side. And when he looks up, I am on the cockpit floor rubbing her head – I was thrown off the seat yet again! It’s a wild and rather uncomfortable ride but we are churning up the miles. 7 hours into the trip we already have 60 miles done. And seeing 9-12 kts starts to feel the norm. We should probably reef, but what the hell, the boat is made for this type of punishment, so let’s get the miles done. Its not often we can average 9kts all in the right direction! Sunset is the classic mid Atlantic version, into the clouds an hour before setting with shafts of light coming through the clouds. Then gone. Only to poke it’s little redhead momentarily below the cloud line a minute before disappearing into the waves. The wind is getting lighter now, 13-14 kts with the occasional gust to 18. But the sea is still up and banging the sails and rig around now that they don’t have enough wind to pin them down. So Glen puts the autohelm to steer by the wind, setting it at 105 deg off the wind. That did the trick, now we have good speed in this light wind and the sails are staying full. We are now going 5deg west of the rhum line, but no matter, we’ll fix that when we have to motor, tomorrow. Interestingly we get another VHF call from Gheko who is now some 15-20 miles behind us. He thinks we must be motoring. When Glen tells him “no, we are still sailing” he comes back with “then you must have more wind than us, or if not how are you set up?”. Glen explains to him how we are sailing. We guess Cloudy Bay is no slouch in light winds! It’s also good that he can still see us on AIS. We lost Gheko off our screen when he was only 7 miles behind. So continues the evening, with a moon rise just before midnight and seas getting calmer. Wind is down to 10-12 knots true. And we are doing a nice 6-7kts in 8kts apparent. Not bad at all.